A quick iPad tip: Turkish Dolmuşes—van-sized mini buses that provide inexpensive regional travel—are too shaky and bumpy for accurate typing on an iPad. I know this because I’m trying to type this while riding on a Dolmuş. I’m heading toward the start of the Lycean way, a roughly 300-mile hike that winds through the villages of Anatolia. Because this will be a backpacking and photography excursion, I’m trying to travel as light as possible. As such, I’ve left my 13-inch MacBook Air at home, and have decided to bring only my iPad, my cameras, and a HyperDrive. This was not an easy decision. While I knew the iPad would be fine for reading email and browsing the web, I was worried about where I was going to offload images, and whether I could do without a full photo workflow. On the upside, I knew I would be traveling with a mid-sized backpack, so the iPad’s lighter weight, and durability was a big appeal. Storage: I am traveling in Turkey for 21 days, shooting raw files with both a 21 megapixel SLR, and a 12-megapixel point-and-shoot. As such, I’ll need a place to dump images, and my iPad 2’s 16 GB of RAM just isn’t going to cut it. A 64 GB iPad would also be too little, even if I were to leave it free of any media or apps. Image Editing: I don’t need to do a lot of high-end image editing, as I can easily wait until I get home to do “real” editing, such as black and white conversion, HDR merging, and selective edits (yes, I know there are tools to do this on the iPad, but they’re just not up to pro-level snuff). But I do need to be able to prepare a handful of images for publication, and I would like to be able to perform some rough edits on a few images, simply to see if I’m getting the images I think I’m getting. Delivery: Finally, I have to be able to get these images to the relevant editors. In addition, I’ll want to send the occasional image-laden email to friends. The iPad was only able to meet all of these specific needs thanks to a few pieces of ancillary gear. With the iPad’s paltry storage, I knew I’d need some kind of battery-powered hard drive. There are devices for backing up images in the field, such as the 250GB Digital Foci Photo Safe ($130), but there’s no screen for viewing images, and there is no way to get the files out of the Photo Safe and onto the iPad if you want to edit or share them. 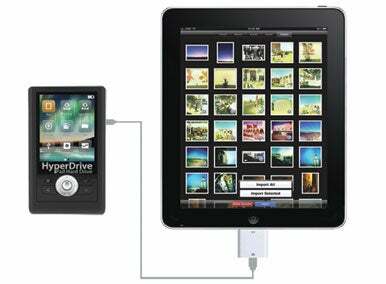 The HyperDrive iPad Hard Drive, like the Photo Safe, is a battery-powered hard drive with media slots for Memory Stick, SD, and CompactFlash cards. I bought the enclosure-only option ($249) and stuck in my own 750GB drive. What makes the HyperDrive unique is that you can plug it into the iPad via Apple’s iPad Camera Connection Kit ($29). When you select iPad mode, the HyperDrive prompts you to select a folder, and then it makes that folder visible to the iPad just as if it were a camera being connected. In other words, the Photos application pops up on the iPad, and all of the images in the folder on the HyperDrive become visible. You can then select the ones you want to import. 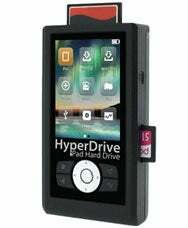 The HyperDrive includes a 3-inch screen that allows you to review your images on the hard drive after transferring them from your memory cards, and to select specific images to transfer. It also provides an easy-to-use interface for the HyperDrive’s more advanced features. For example, by selecting the Manager option, you can manage the files that you’ve already copied to the drive. You can delete, copy, or move files. Although the interface to these options is a little clunky, they’re not operations that you’re likely to perform that often. The HyperDrive is a great solution for iPad storage problems. You can dump huge batches of images onto it, but only pull in a handful to your iPad that you want to edit or review, or that you need to submit for work or send to friends. I didn’t realize until I was on the road that my particular unit had a bad SD port, but I was able to work around this by plugging the camera directly into the HyperDrive via its USB port. With my storage problem solved, I now have the option of editing any image that I’ve shot at any time during the trip. I can browse images on the HyperDrive to zero in on the folder that the image is stored in, and then connect the HyperDrive to the iPad to import the images I want. For the actual editing, I use a handful of different applications. The bulk of my editing operations are performed in PhotoGene ($3), an excellent image editor for both the iPad and iPhone. Because of its small screen size, touch-based interface, and lack of screen profiling, you shouldn’t expect to do heavy image editing on the iPad. But cropping, basic tonal adjustments, and white balance correction are definitely doable. PhotoGene has a very good, streamlined interface that makes it easy to perform these adjustments. In the Adjustments panel, you can use sliders to alter Exposure, Contrast, Saturation and Temperature, while adaptive shadow and highlight controls make it easy to brighten up shadows, or darken highlights. A full Levels adjustment, with Histogram makes more sophisticated tonal adjustments a snap, while for those who prefer it, there’s an excellent Curves tool. If you’re shooting raw, note that PhotoGene does not perform highlight recovery, so if you’re hoping to pull detail back into a sky, or recover any other bright highlight, you won’t be able to. Unfortunately, PhotoGene won’t let you perform selective edits. For that, I use FilterStorm ($4). In FilterStorm, any edit can be painted on using a paint brush, making it easy to selectively alter any part of an image. FilterStorm also provides a channel-mixer for performing black and white conversions, something else PhotoGene won’t do. If you’d prefer to choose a single editor, go with PhotoGene. I keep them both around, and turn to FilterStorm for black and white conversion and selective editing. AutoStitch ($1) is an excellent panoramic stitching application for the iPhone, which runs just fine on the iPad. There’s little to say about it other than it works, and it works fast and well. Point it to the images in your panorama, and it will stitch them together into a seamless, complete, very wide image (assuming you’ve done a good job of exposing and panning your original shots). ProHDR ($2) is another iPhone app that transfers to the iPad with no problem. It allows for the creation of HDR images from two source files. While the results aren’t as good as what I can get using HDR software on my Mac, for quick-and-dirty merges—both to get an idea of whether a shot works, and to generate images to send home—it works great. When I’m done with my image editing, I save the JPEG files to the iPad’s Photos app, and then erase the raw file in the Photos app. I still have the raw file on the HyperDrive, so by storing only JPEGs of my finished images, I maximize the use of the iPad’s storage. Ultimately, when I get home, I’ll re-edit many of the images in Photoshop. After transferring images to the HyperDrive, I leave them on the card and go to the next empty card. When it’s full, I transfer and move on to the next card. I don’t start reusing cards until my entire collection is full, and then I start reusing with the smallest card first. This affords me a tiny bit of redundancy—my most recent images will still be on the cards if something happens to the drive. I’ve given up on trying to type while riding on a bouncy Dolmuş, and am now working from solid ground. For long articles, I’ve also given up on typing on the iPad’s on screen keyboard, as it’s just too finicky, and I miss having a tab key. Instead, I’m using an iGo Stowaway Ultra Slim keyboard. This excellent keyboard folds in half to collapse down to a very small 4 by 3-inch package, and connects to the iPad via Bluetooth. It’s powered by two AAA batteries, and I find it can go for a few months on a set of rechargeable batteries. Unfortunately, it’s also no longer made, but you can usually find them on eBay for a fairly reasonable price. A similar product that is available is the Verbatim 97537 Bluetooh Mobile Keyboard ($80). AT&T’s roaming rates are even more ridiculous than its domestic fees, so I jailbroke and unlocked my iPhone 4. Upon arriving in Istanbul, I went to a Vodacom store and purchased a SIM card with phone service and a month of unlimited data for about sixty dollars. This gives me a local phone number, and I can put money on the card for phone calls and text messages. Adding time to the card is incredibly easy, and there are Vodacom locations all over the country. There’s also 3G support in most places here, and where you can’t get 3G, there’s usually Edge. What’s more, 3G and Edge are much faster here than any that I’ve experienced in the US. Because the phone is jailbroken, I can run MyWi ($10), an excellent tethering application which turns the phone into a Wifi hot spot, connected to the Internet via the phone’s data connection. So, I can easily activate MyWi to create a hot spot, and then select that network on the iPad, and the iPad is online. So far, the whole scheme is working, and I have not regretted leaving my MacBook Air behind. Sure, there are times when I’d like to see what an image would look like if I could recover some overexposed highlights, or to see how it might look converted to black and white with Nik's Silver Efex, but for the most part, I’d prefer not to be looking at a screen, or editing images while traveling in this wonderful country. For the bit of editing that I need to do, the iPad and HyperDrive combo is working great, and doesn’t take up much room.